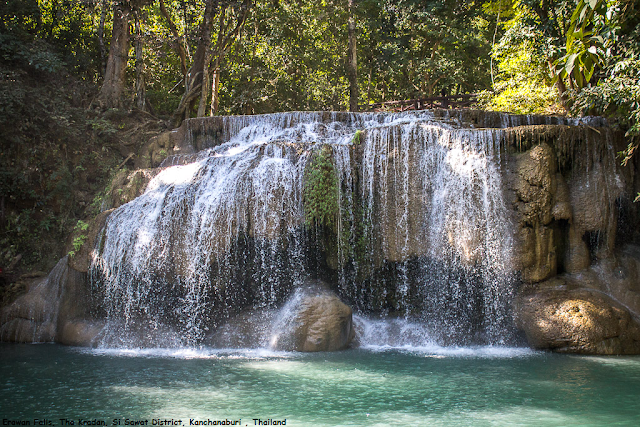 This is the 2nd level of Erawan Falls, Tha Kradan, Si Sawat District, Kanchanaburi , Thailand.This falls is called Wung Macha. Given how pretty the falls was, it is no wonder why there is such bustle of activity. You have a good time taking photos from here while also chilling out and basking in the atmosphere of the scene. Come to think of it, perhaps the first waterfall might have been a perfectly fine swimming hole, but the second waterfall completely overshadowed it thereby causing it to become a victim of the lemmings effect.